Join our Team - we look for quality people who live close to our service area. We're very selective about the people we hire. New applicants are thoroughly screened. Before hiring, they are subject to a background investigation, including employment history and a criminal background check. Also must be DRUG FREE, as we are a Drug Free Workplace with random testing. We know that to attract, motivate and retain quality people requires excellent compensation. Hiring minimum wage workers can only result in minimum performance. 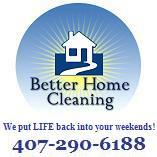 We try very hard to make Better Home Cleaning an enjoyable place to work. Many of our employees stay with us for years. • Reliable, insured vehicle, although you would usually use a company vehicle.